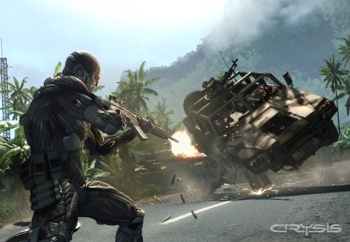 The similarities between Crysis and Halo put the publisher off the deal. The Crysis series has just made its multiplatform debut with Crysis 2, and it looks like the original game could soon be gracing the PS3 and Xbox 360. But had things gone a little differently, the Crysis series, as well as everything else that developer Crytek made, would have been a Microsoft exclusive. Phil Spencer, the corporate VP of Microsoft Studios, says that around 2003-2004, Microsoft met with Crytek CEO Cervat Yerli with a view to buying the studio and turning it into a first party developer. Spencer said that he asked the studio what it planned to do next - it was around the time that Crytek released Far Cry - and that when revealed its vision for Crysis, Microsoft decided to pass, saying that it had enough sci-fi shooters as it was. Crytek has continued to have a good relationship with Microsoft though, with Spencer calling their collaboration on the Kinect-exclusive Ryse, the "perfect marriage." Whether Microsoft buying Crytek would have been a good or a bad thing largely depends on your point of view, but it's amusing to note that if Halo hadn't got in the way of the deal, Crytek could have ended up making new Halo games instead of 343 Industries. It seems unlikely that Crytek has too many regrets though, having found not inconsiderable success on its own.